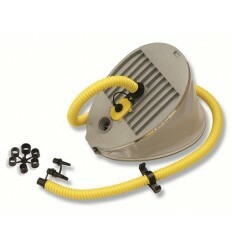 Bravo 9M Bravo 9 Dual Function High Pressure and Standard Inflatable Boat Inflation Foot Pump. This pump has 2 inflation chambers. One chamber inflates the inflatable boat pontoon or tubes and the other chamber inflatables the high pressure airfloors up to 14 psi.